A grisly murder occurs outside an apartment building in a blue collar section of New York City. As the victim, Kitty Genovese, screams and struggles, a dozen neighbors hear her and go to their windows. It is dark and they cannot see precisely what is going on, but they can see and hear enough to know something bad is happening down on the street. No one calls the police or offers Kitty any substantial help. 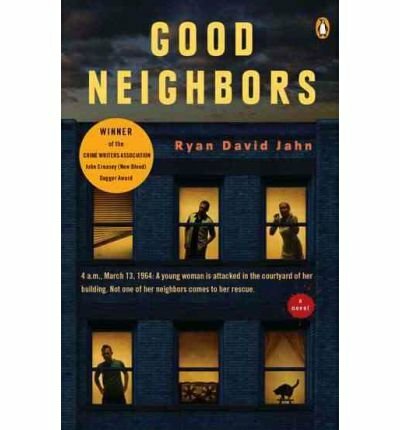 Ryan David Jahn’s Good Neighbors explores the lives and psyche of each of these bystanders in attempt to explain why. The foundation of Good Neighbors is factual. Kitty Genovese was a real person brutally knifed to death in 1964 as her neighbors looked on. But she’s only a minor character in the book. Her fictionalized neighbors are the stars, and Mr. Jahn has a created melancholy ensemble cast that includes a an out-of-love couple dealing with a recently-confessed extra-marital affair, an inter-racial couple in a racist world, two men exploring homosexuality, an adult son caring for his terminally ill mother, among others. Most of these mini-melodramas are bittersweet, i.e., the caregiver adult son informs his mother that he’s been drafted for Vietnam and his loving mother encourages him to keep silent about her illness to his draft board. But a few of the mini-melodramas are just bitter—such as the one built around the corrupt and malevolent neighborhood cop. Despite an apparent infatuation with the macabre, Mr. Jahn shows a strong interest in getting his facts contextually correct. Although his book is not remotely political, Mr. Jahn drops into his narrative nuggets about institutionalized racism and the Vietnam War. His precise descriptions of 1960s cars or items on a New York diner menu suggest an author who did a lot of homework on American life circa 1964 before he started writing. Good Neighbors benefits from the resulting air of authenticity. Promotional materials for Good Neighbors compare it to the ambitious Oscar-winning movie Crash. Both feature interlocking micro-plots woven around a single traumatic event. I wouldn’t dispute the comparison, but suggest a second comparison. Good Neighbors has the narrative trappings of Erik Larsen’s Devil in the White City: Both books are built on the premise that fictionalizing a real life event can be more compelling than straight fiction. Both books intermingle fact, conjecture, and compelling storytelling to create powerful narrative. Of course, regardless of whether Good Neighbors is more like the movie Crash or the book Devil in the White City, it clearly deserves to be placed in such excellent company.